Returning to Southern California after 7 years in the desert was refreshing, to say the least. The experience reminds me of slaking a torrid thirst. The first draught of fresh water charges your body, mind and soul. In our case, it was slaked with saltwater, and the goal was to get to the beach as often as we could before the summer was over. For the next couple of weeks we tried to make up for all the summers missed at the beach while we dried up in chlorinated water or air that literally sucked the moisture out of your body. Despite having grown up in Southern California, my exposure to its natural wonders, even the beaches I grew up very close to, was limited. I hung out at three beaches in my youth: Redondo Beach (Avenues C-E,) Hermosa Beach (3rd St. and the pier,) and occasionally at the Manhattan Beach pier. There was the occasional trip to Venice also, and I frequently visited Oxnard Shores by necessity (my grandparents lived there,) but it wasn't the hot scene down in the South Bay. When we returned from our sabbatical in Arizona, I made it a point to discover new beaches and hidden treasures. Here are 3 fantastic beaches I missed growing up. 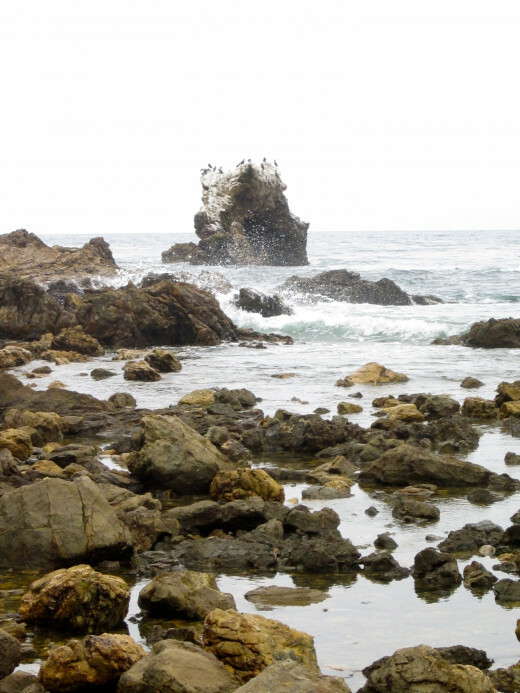 If you live in Southern California or plan on visiting, be sure to put these beautiful spots on your itinerary. Better yet, toss the itinerary, pack a big cooler, and spend a day or two going from one end to the other. Stay on Pacific Coast Highway and you can’t miss. How had I missed this gem? 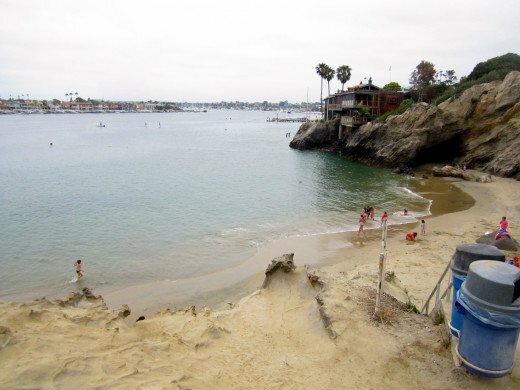 Corona Del Mar is a half mile of flat, soft sand cuddled on one end by tall cliffs and on the other by a harbor jetty. This is a beautiful spot reminiscent of the old school beach days. As of this writing, one end of the beach is dotted with city fire pits, which all but beg people to stay at the beach until the sunset fades, then sit around a blazing bonfire with friends and family and a couple of guitars. CDM beach features volleyball courts at either end of the sand, a ‘snack shack’ with tasty and reasonably priced food (try the breakfast burrito with sausage and ham or the chicken w/ pesto sauce sandwich,) and a view of sailboats drifting in and out of the small harbor past the jetty. What makes this beach sweeter still are the sandstone rock formations surrounding the quaint Pirate’s Cove behind the jetty. 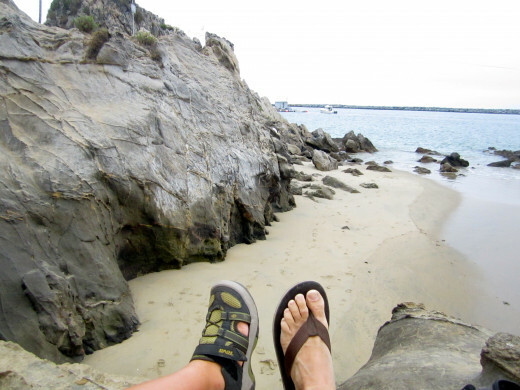 Named for the movies and TV shows this location has played host to, Pirate’s Cove is a fun place to explore, a gentle enough spot for kids to play in the water and a fascinating spot to go bouldering. If you come to stay for the day, get to Corona Del Mar early. During the summer, people will be setting up umbrellas and shelters as early as 8:00am. The beach parking lot is convenient, but costs $15 for the day. To avoid this, take a little hike down the hill and park on Ocean Boulevard. The views are spectacular, and you might just want to come back this way to visit spot number two. On the day we set out to explore Corona Del Mar, we were not even aware there was a “Little Corona Del Mar.” I was taking the kids on a hike to explore some sea caves which were supposedly located in Corona Del Mar, and all I knew was that it was located past some spot called Inspiration Point. Fortunately we found Corona Del Mar first and spent a few minutes talking to a couple of super helpful lifeguards who pointed us in the direction of our next adventure. It looked so close I even considered marching us around the cliffs to get there, but on a beach things often look closer than they really are. Besides, marching around rocky cliffs with the waves crashing against them is not recommended under the best of circumstances. We opted for the moderately strenuous hike up and over the hill to the other side. 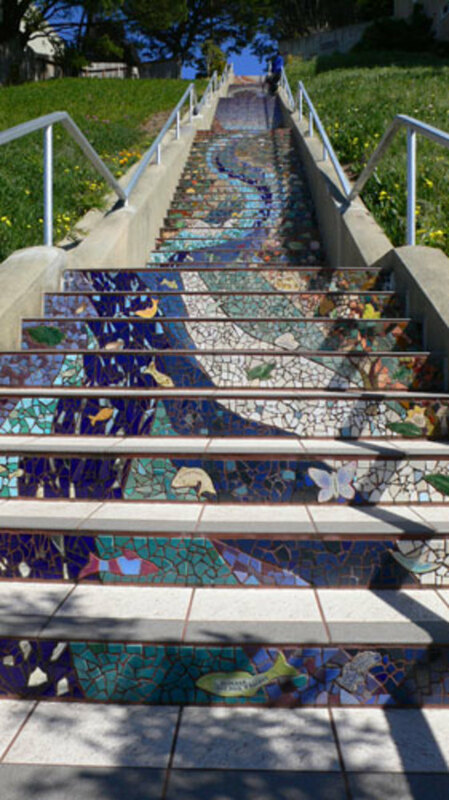 This path rewards you with beautiful views and a stop over at a viewpoint called Inspiration Point. 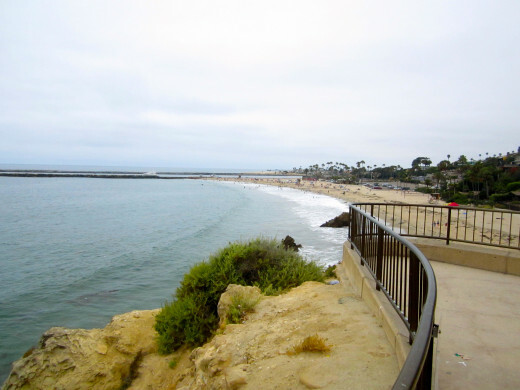 This happens to be where we began our trek down to Big Corona Del Mar Beach, but at that hour the concrete lookout was hosting a morning bootcamp workout. To get to Little Corona, you continue following Ocean blvd., which is lined by beautiful homes on either side, to a paved pathway leading down to the beach. 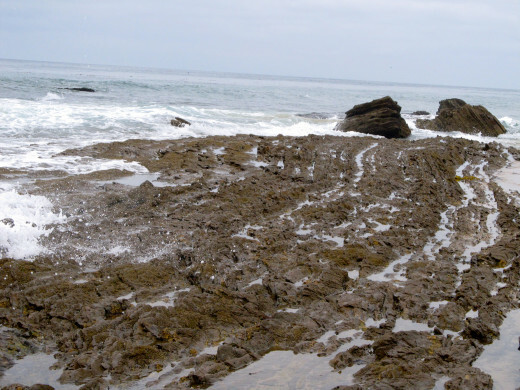 From atop the hill, the rich texture and colors of this beach’s tide pools and rock formations come into view. The place begs to be explored, and when you get to the bottom you find out why. Docents staff a booth with samples of the local tide pool marine life, which includes rock and shell samples, sea anemones, sea stars and dozens more. While you are encouraged to locate and view as many of these special creatures as you can, touching them, taking them or disturbing them is prohibited. 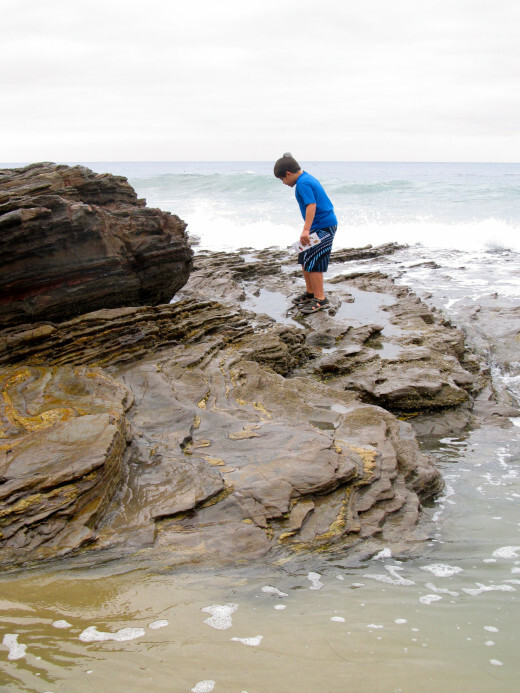 Their survival depends on this ‘observation only’ policy, and it is kindly enforced by one locally famous docent who shows up anywhere there are kids reaching into tidepools. She keeps a close eye on them while continuing to educate about the fragile tidepools and their residents. This prohibition does not take away from the LCDM experience, however. Both ends have intricate rock formations to explore, and the north end offers great easy climbing opportunities. Being on the beach below the cliffs here, it feels like a private paradise. However, if you are looking for crystal clear waters, you might be disappointed. Close to shore the water is dense with seaweed, but still swimmable. 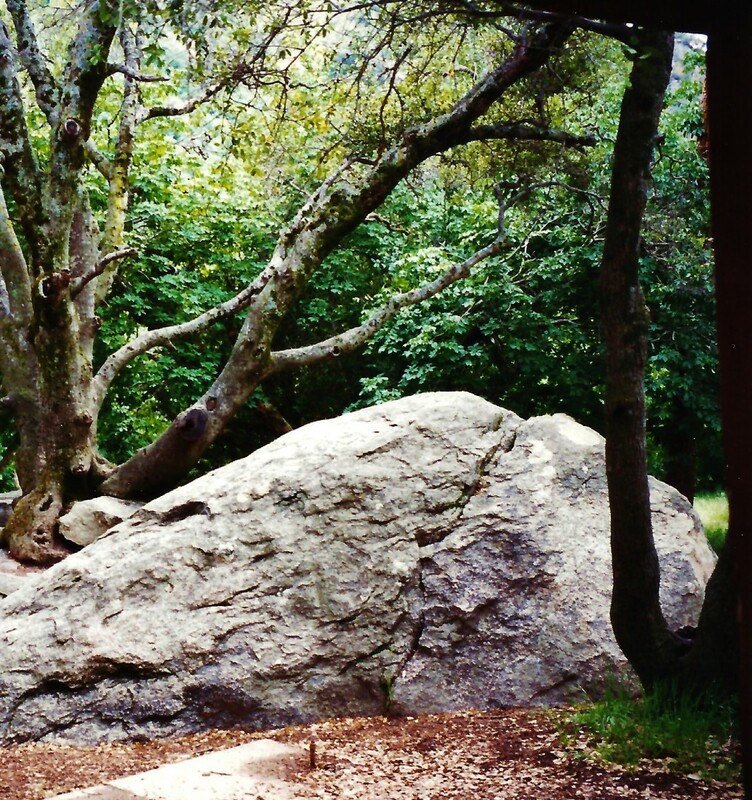 Little CDM is a treasure worth visiting, and if you go be sure to bring some water shoes to climb around the rocks in. 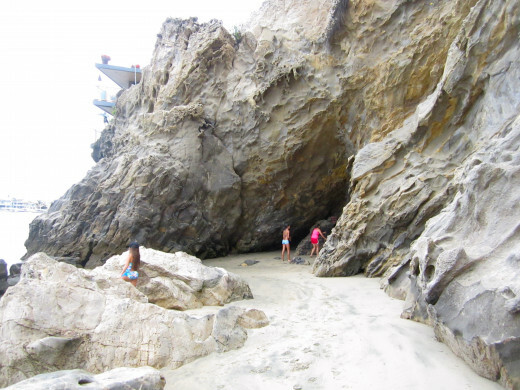 The best way to reach these hidden gems is by taking Pacific Coast Highway to Poppy Ave. Turn right onto Ocean to get to Big Corona Del Mar beach. -Did I mention the long beach? Tall cliffs? Forget brief. 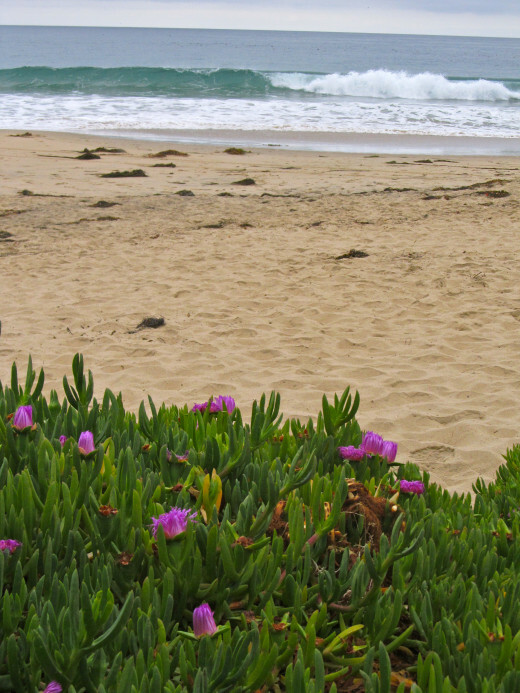 Crystal Cove is worthy of some additional promotion, and a definite must-see if you come out to Southern California. 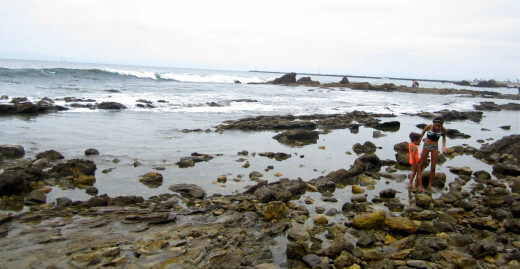 Located off Pacific Coast Highway between Laguna Beach and Corona Del Mar (just look for the signs, it’s hard to miss,) it is a unique place you will want to return to. 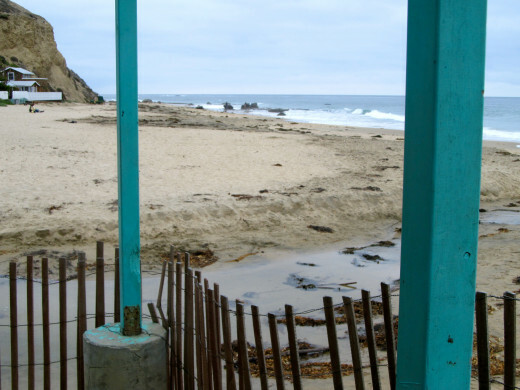 It is also the only beach I know of that can be accessed by walking down a hill and through a tunnel painted in environmental art by grade school kids. There is also a shuttle at the top of the hill to take visitors from the parking lot to the entrance of the beach park. Choose to walk down from the parking lot at least once. The colorful ocean art filled tunnel is worth seeing at least once, and you get to feel a sense of what it was like to walk down to the Crystal Cove beach decades ago. The beach cottages are available to rent year round, but book early because they are few and fill up fast. 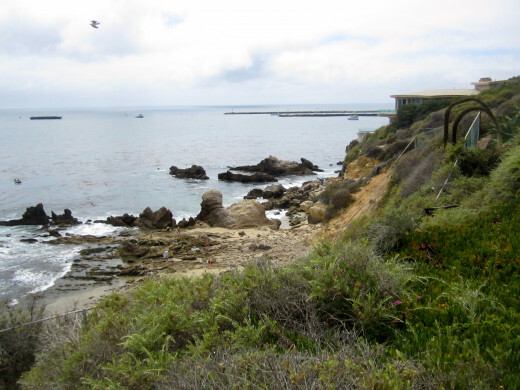 The renovated colony is located in the Crystal Cove State Park Historic District, and became a seaside community throughout the 1930’s and 50’s. Spared from destruction, and restored with help from the Crystal Cove Alliance, a total of 13 individual and 3 dormitory style cottages have since been returned to their original quaint beauty. This area has since been placed on the National Register of Historic Places. Whether you walk or take the shuttle, you enter this historic district through a small fenced opening in the trees at the bottom of the hill. This ‘gateway’ opens onto a dirt path that leads to the beachside store, Beachcomber restaurant, Bootlegger bar and beach cottages, all in the original architectural style. If you go to have breakfast and a walk on the beach, get there early and consider bringing your usual beach gear. Before 8am there is little or no wait. It tends to be chilly at this hour, so bring a sweatshirt or use one of the blankets the restaurant provides. By 8-8:30, this popular spot is usually running a 20-30 minute wait, which doesn’t seem to bother anyone. The beach is a great waiting area and they give you a buzzer with a long range. 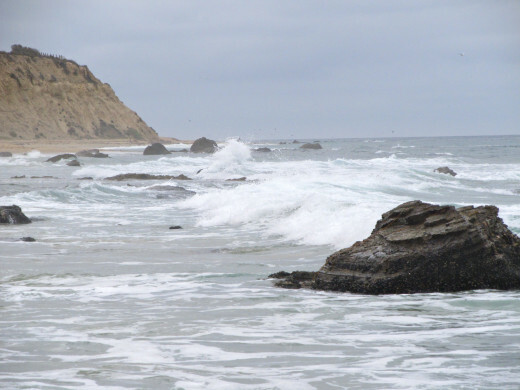 Crystal Cove has endless photographic opportunities, and is simply a great place to spend a couple of hours or a couple of days. Put this at the top of your must-see list! 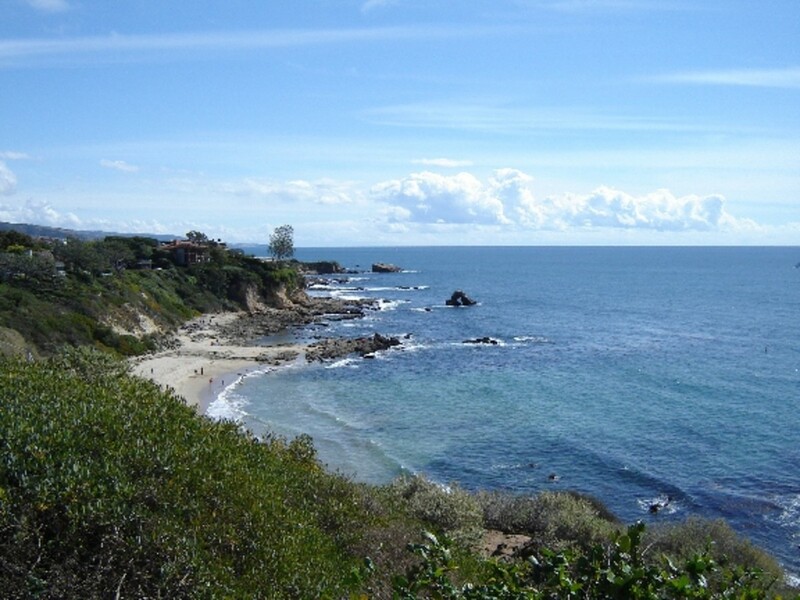 From PCH (1), start at Crystal Cove, then head North and visit Little Corona and Big Corona Del Mar beaches. Or start at CDM and head south. Hiking the Grand Canyon with kids. Absolutely! Follow our adventure on The Bright Angel Trail, a great place for first time canyon hikers. Pull off of the highway in the empty desert and drive down a dirt and gravel road to nowhere. You just might find a hidden treasure, an ancient monument, or some shotgun shells. A trip to Kailua Hawaii on the Windward side. This may be one of the best destinations in the world for all ages. Watson Lake in Prescott Arizona is a scenic reservoir surrounding by giant natural sculptures called the Granite Dells. If you live in or plan on visiting Arizona, this is a must see destination. There is more to the desert than scrub, rocks and dirt; but even these can be interesting in the right light. Take a journey with me and get a fresh look at everyday desert plant life. Thanks Suhail! Hope you come, you won't be disappointed! 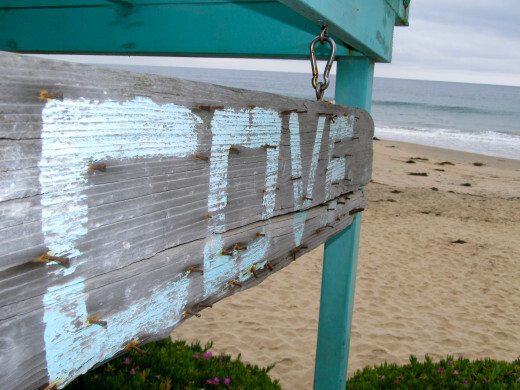 Awesome hub on the hidden touristic gems of SoCal and great pictures to go along! 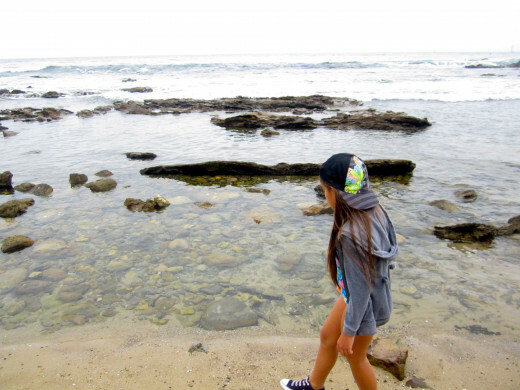 The rocky beaches remind me of our own lake shore beaches of Ontario, but I am sure that your waters must be warmer.